Blu-ray(TM)/DVD Combo and DVD Streets November 27th. BEVERLY HILLS, CA - The Day , from WWE Studios and Anchor Bay Films, comes to Blu-ray(TM) and DVD on November 27, 2012. A film which Variety called, "...one of the most effective horror movies made in years," The Day stars Shawn Ashmore (X-Men 2&3, The Ruins, Frozen), Ashley Bell (The Last Exorcism), Cory Hardrict (Battle Los Angeles, Gran Torino), Dominic Monaghan (The Lord of the Rings trilogy, "Lost"), Shannyn Sossamon (One Missed Call, 40 Days and 40 Nights), and Michael Eklund (The Divide, Hunt to Kill). After a successful world premiere at the 2011 Toronto International Film Festival, the film was theatrically released by WWE Studios and Anchor Bay Films earlier this year. 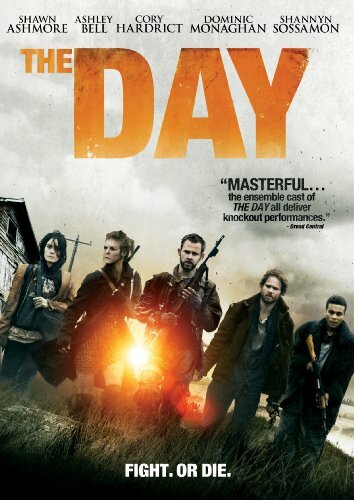 The Day is available as a Blu-ray(TM)/DVD Combo for an SRP of $29.99 and on DVD for an SRP of $26.98. Pre-book is October 31st. A group of five survivors, armed with shotguns, axes and machetes, wander the back roads of a ravaged landscape looking for refuge in The Day , a terrifying look into a post-apocalyptic future. As war ravages humanity, destroying civilization and most of life on earth, the survivors realize they must do whatever it takes to stay alive. Lost, starving, and exhausted, they seek shelter in a seemingly safe abandoned farmhouse. However, while searching for food and resources, they unwittingly set off a trap signaling to their ruthless predators lying in wait to begin their deadly attack. With food and ammunition dwindling, the group must make a desperate final stand--over a 24 hour period--battling for their ultimate survival. Bonus features on The Day Blu-ray(TM)/DVD Combo and DVD include audio commentary with executive producer/director Doug Aarniokoski, producer Guy A. Danella and writer Luke Passmore. WWE Studios continues to strategically diversify its slate of films, which includes theatrical releases and direct-to-home premieres, under the guidance of President Michael Luisi. Upcoming films for WWE Studios include: Dead Man Down, which was co-financed with IM Global and will be distributed by FilmDistrict, starring Colin Farrell and Noomi Rapace; The Hive, which was co-produced with Troika Pictures, starring Halle Berry and Abigail Breslin; The Curse of the Ghost Bear!, an animated feature from Warner Brothers Animation that will find Scooby Doo and the gang teaming up with WWE Superstars to solve a mystery at WrestleMania; No One Lives, which was co-produced with Pathe Films and world premiered at the 2012 Toronto International Film Festival during Midnight Madness.